The rest of the world imagine Asia as some exotic and wild gardens full of lush plants, releasing their enticing scents in the sunny air, with lively colored and golden temples. Well, Thailand holidays take you to the most appealing of Asia’s gardens, having a very distinct touch of aristocracy and heavenly beaches. Thailand stands for “the land of freedom” in Thai language, and actually the Kingdom of Thailand is the only area in South East Asia which has never been colonized. So this should be the best preserved and most refined Asia piece of land you might find. And you don’t have to think of a rigid and very traditional society; on the contrary it is well known Thai’s interest in taking contact with other civilizations and cultures. The people who empower one of the miracle economies in Asia are educated and have a cosmopolitan interest in Western culture. Just to offer you a suggestive image, Thai people are very big fans of Premiere League and built around 60 first class golf courses! An enormous city with 6,5 million inhabitants and a vibrant economy, Bangkok is full of Asia’s splendor. Starting with traditional attractions, don’t miss the gorgeous Grand Palace complex and the most famous temples, Wat Phra Kaeo with the stunning 14th century Emerald Buddha and Wat Pho with a 150 feet golden statue of reclining Buddha. Your experience in the town will not be complete without shopping, either in some huge commercial areas pretty similar to Western malls offering a good deal of bargains, but rather recommended in some more traditional places like Chatuchak Weekend Market. If you want to melt into the crowd of tourists from all over the world, you can go to Khao San Road, which is full of street restaurants offering delicious rice, noodles, seafood and a lot more flavored dishes. This particular route could bring you closer to South Asia’s landscapes and traditional Thailand. Just 108 miles of Bankok you can find Khao Yai National Park, preserving great areas of monsoon forests. Around 300 wild elephants live here, besides exotic species of birds and animals, like tigers and leopards. Don’t worry about your safety, as guided tours and protection means are available. Then you may want to take a glimpse of the Khmer-era temple ruins in the Nakhon Ratchasima Province. Another appealing experience is a walk through the rice fields, by foot or by traditional oxen powered carts, ended with a delicious meal cooked at a traditional farm. Eventually you will get to Chiang Mai, which may be the second-biggest city in Thailand but is sure a lot more tranquil and relaxing than Bangkok. There you can visit two marvellous temples: Wat Phra Singh and Wat Suthep on Doi Suthep’s summit, from where a extraordinary panoramic view towards the city will open to you. When it comes to sea and beaches, it is hard to find better ones elsewhere in the world, due to the spectacular combination of fine sand alongside the exotic forests, clear and blue water and rocks emerging from the sea. Most famous destination are Phuket – a luxurious and exclusive resort on the coast of the Andaman Sea in the south of Thailand, Krabi – the perfect place to film commercials due to its high limestone rocks covered in lush vegetation, Ko Phangan – providing marvellous beaches, wild nature and relaxation even for the budget travellers. 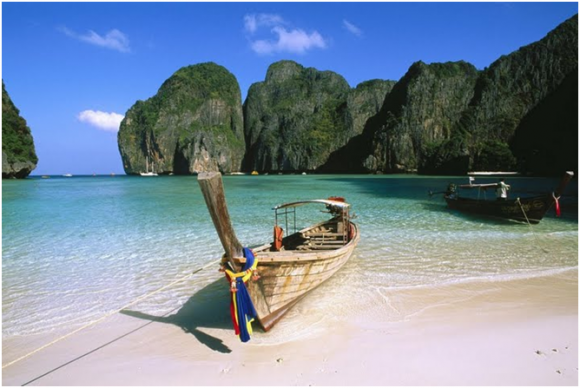 Enjoy the aristocracy of Asia on the beaches of Thailand! Ooooo, a series by S.M. Stirling and David Drake! Lemme guess, they’re so long out of print, I’ll be hard pressed to find one.Arlington was the main jist of my Memorial Day post, after finding inspiration watching the President laying a wreath at the Tomb of the Unknown Soldier. Es preciosa!! Mi hijos ahora estÃ¡n locos con los dinosaurios (los Reyes y Henrry y su cubo de dinosaurios tienen la culpa) y se volverÃ­an locos con esta tarta! !Supongo que todo lo que compraste tambiÃ©n se puede conseguir por alguna tienda on-line, no?Si sabes de alguna por favor dinoslo (marcas tambiÃ©n, para ir sobre seguro) Gracias Teresa!! !